It’s hard to believe that this month marks one year since United (Operated by SkyWest Airlines) began offering service at SHD! As many of you have now experienced for yourselves, flying out of the Valley has never been more attractive. We are in the mood to celebrate our success over the past year and offering free travel seems like an excellent way to do it. Stay tuned for information below on how you can enter to win $500 towards your next trip from SHD! It’s difficult to comprehend how much of an impact that the new service has had over the course of the year but one thing is for sure – SkyWest has delivered on everything they promised to bring to our community, plus some. Their reliability has been impeccable. Passenger experiences have been A+. And my very favorite part is that YOU have been able to travel to where you need to go within the United network easily and stress-free. Since the partnership with SkyWest began, passenger traffic has increased 260% overall! With just nine months of the new service in 2018 we surpassed passenger traffic records held for nearly two decades and I’m happy to report 2019 is shaping up to be even better! You can read more about the transformation we have experienced in the two articles below recently published by the Daily News Record. We’re incredibly excited about our partnership with SkyWest Airlines and want to thank you all for your support. The sky is truly the limit on what we can accomplish together, however, there is still work to be done. We as a community must continue to demonstrate that this region prefers local air service for the market to truly realize it’s full potential. To that end, we are asking for your help. We want to hear from you regarding the service over the past year – what you like about it, how often you have flown with us and, just as importantly, why you may not have been able to take advantage of it. 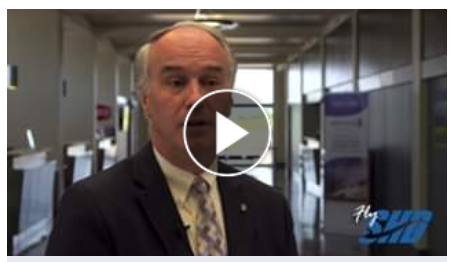 This information is also very useful when we periodically meet with airlines so your feedback could have a direct effect on the future of air travel at SHD. And you can win a $500 travel voucher from your favorite airport… Did I mention that part? THANK YOU for making the past 12 months a great first year for United service at SHD! https://flyshd.com/wp-content/uploads/2019/04/DSC_0178-1-e1554929113239.png 400 600 Shenandoah Valley Regional Airport /wp-content/themes/shd-enfold-child/images/logo.png Shenandoah Valley Regional Airport2019-04-10 16:47:492019-04-10 16:47:49We Did It! And To Celebrate, You Could Win a $500 Travel Voucher! Some upcoming travel changes are quickly approaching that will affect everyone that flies! Beginning on October 1st, 2020, federal regulations will require a new form of identification for boarding domestic flights called a REAL ID. Although there is plenty of time ahead before that change is made, we want to ensure that travelers who rely on us to get them where they’re going remain as informed as possible. That’s why we’re having representatives from the Virginia Department of Motor Vehicles on hand to answer any and all questions about REAL ID. Prior to the event, we also wanted to field some frequently asked questions about what this regulatory change is going to mean for travelers in Virginia. REAL ID is a new federally standardized method of issuing identification. In the state of Virginia, newly issued driver’s licenses and identifications from the DMV offer you the option of being REAL ID compliant. After October 1, 2020, all Americans will be required to show REAL ID compliant credentials before boarding a domestic flight or entering certain federal buildings. An unexpired US Passport will also allow residents to board a domestic flight. How do I know if my current Virginia’s Driver’s Licenses and ID cards are REAL Compliant? You can check to see if your current ID is compliant by looking for a small black star in the upper right-hand corner. If the star is there, you’re in the air. How do I apply for a REAL ID compliant license or ID card? This seems like a lot. Where can I find more information? If you are unable to make our REAL ID event on April 4th from 12pm-5pm in the SHD Airline Terminal, we encourage you to check out dmvNOW.com/REALID for more information, including the entire list of documents that will be accepted in order to issue a REAL ID. DMV also has a really great interactive Document Guide to assist you in choosing exactly what documents you will personally bring to apply. It is important to us that you’re able to travel as smoothly as possible through our airport. We want to do everything we can to arm you with information about this change in federal policy and hope that you will accept our invitation to find out more in person during our REAL ID information session on April 4th! Lace up your sneakers and gather your friends and family – registration opened TODAY for the 2nd Annual Run the Runway 5K + Kids Fun Run at SHD on April 13th! 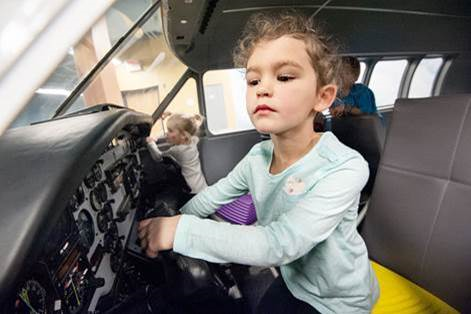 All proceeds from the Run the Runway 5K + Kids Fun Run will benefit the Explore More Museum’s aviation exhibit where children can learn about the many aspects of aviation including hands-on experience as a pilot, aircraft mechanic, air traffic controller, and passenger. Through a partnership with Dynamic Aviation, the Explore More Museum has already installed a King Air fuselage as the anchor piece of this exhibit. 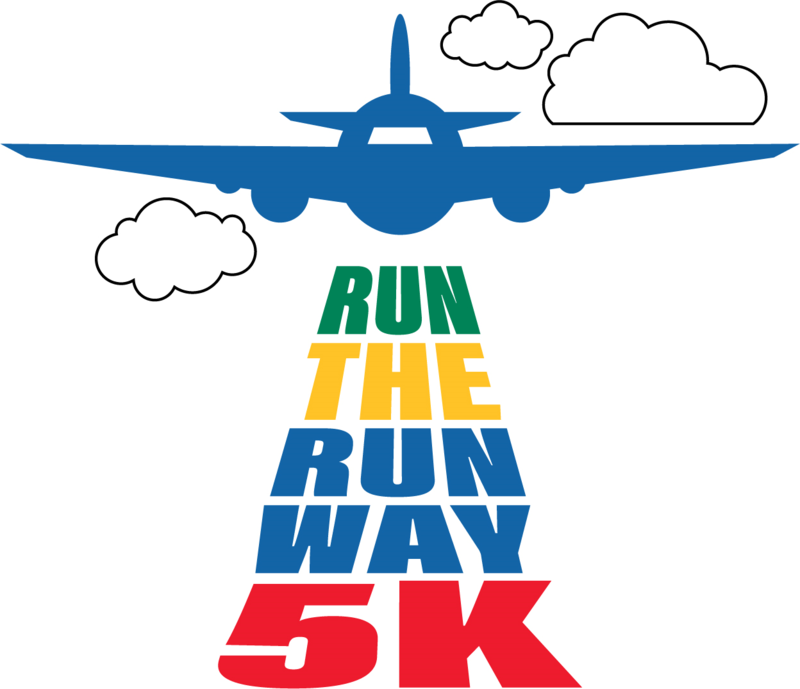 Our Run the Runway 5K raised over $10K in 2018 and assisted in the installation of an air traffic control tower (shell only) and a partial airline terminal component of the exhibit. Funds raised from the 2019 event will enable further development of this space including internal components of the air traffic control tower, a mock TSA screening area in the airline terminal and a hands-on aircraft maintenance component. We feel strongly this exhibit has the power to inspire the children of today to be our aviation workforce of tomorrow! For more information about the Explore More Museum, visit www.iexploremore.com or sign up to participate in the Run the Runway 5K + Kids Fun Run here. Take advantage of early bird pricing until March 15th! Can’t participate in the event but would like to be involved? We are looking for event sponsors too! Click here to learn more. https://flyshd.com/wp-content/uploads/2019/02/DSC_0128.jpg 860 1290 Shenandoah Valley Regional Airport /wp-content/themes/shd-enfold-child/images/logo.png Shenandoah Valley Regional Airport2019-02-28 18:48:352019-02-28 18:48:352nd Annual Run the Runway 5K + Kids Fun Run - Register NOW! Love is in the air for Valentine’s Day, and we’re counting the ways we L-O-V-E all of our SHD travelers! From rallying behind the new United service powered by SkyWest to helping us break a 20-year old record for monthly passenger traffic, we are honored to be your airport of choice. In fact, check out these “love letters” we’ve received from local travelers just in time for Valentine’s Day! Happy Valentine’s Day to you and all of your staff from lovely and warm Charleston, SC! After a successful week of teaching at the Sheriff”s office, I am so looking forward to seeing you tomorrow! I must say, flying for business is so much less stressful now that United and SkyWest have come to town. With connections to both Dulles and O’Hare, I can get to my classes that are scattered all over the US with fewer layovers and less wasted time. Just getting to the airport is easy, no drives over foggy mountains or (gasp!) to northern Virginia! Plus, nice people to talk to at the airport and no long lines to check in. And when I get back after my trip, I just grab my bag, find my keys, and go. No stops to pay tolls or parking fees which just keep going up! It’s like buying a plane ticket for my car! Life is good when you travel SHD! See you tomorrow! Traveling every week for ESPN, I have a “love” affair with SHD! I have FREE parking, friendly employees, and TSA and staff to greet me each week. Flying through Washington Dulles or Chicago O’Hare, I can get anywhere in the country without driving two hours. Recently, I was able to cash in my United miles for a ski trip to Bozeman, Montana. SHD is convenient with reasonable airfare that doesn’t break my “heart” or wallet! So, if you want to make an impression on your sweetheart, book a getaway from SHD today! As the Executive Director of the Gilliam Center for Entrepreneurship here at James Madison University I have a monumental challenge. I want to show that the Shenandoah Valley can produce as good or better student startup companies when compared with Silicon Valley. SHD is an important partner in answering this challenge! Early this fall, we held an event for Women Entrepreneurship Week. We had two Founder CEOs, a Managing Partner, and a Founder of a Venture Capital company. These women executives flew from CT, Chicago, and NYC. They were all able to fly in the day of the talk and fly out early the next day. Such seamless and timely transportation is paramount for such high-quality executive speakers. Often, I need to fly for a conference and give a speech on our work here at JMU. This fall I needed do so for a conference that was in Chicago. The direct flight was the best-ever. In my personal life, my children reside in Connecticut, and my fiancé is an entrepreneur owning her own high-end interior designer business operating out of New York City. Having SHD ten minutes away from our Harrisonburg home is great, as we no longer have to deal with Dulles or Reagan National and the corresponding logistical nightmare that is NOVA traffic and parking!!!! My fiancé Bridget has made fast friends with many of the TSA agents, all of whom who are so nice, professional, and welcoming. During the government shutdown there were tales of many airports operating less than efficiently during that time, but Bridget and I flew to Florida for some needed R&R and sunshine. Everyone at SHD was a true delight. To receive prompt service, a smile, and a warm greeting at such a time shows how incredible everyone at SHD really is. We look forward to utilizing SHD for years to come. https://flyshd.com/wp-content/uploads/2019/02/minimalistic-valentine-s-day-background_1199-190.jpg 391 626 Shenandoah Valley Regional Airport /wp-content/themes/shd-enfold-child/images/logo.png Shenandoah Valley Regional Airport2019-02-14 20:15:572019-02-14 21:10:09Love is in the air at SHD! Working at SHD, we get to see a lot of special travel moments – a child excited about their first “big plane” flight, reunions with out of town friends and families, and excited teams off to play their next big game! Business travel can be a little different though. As busy professionals, it can be hard to balance work, travel, and the important family moments that you don’t want to miss. So, when we heard the following story about how SHD helped save Father’s Day for one busy business traveler, we just had to share it. We love providing reliable service to all our travelers, and we especially love knowing that the benefits of flying local put those “don’t want to miss moments within reach” for those on the go. Some of you may know Dr. Kevin Ratliff as the Dean of Workforce & Continuing Education at Blue Ridge Community College. However, Dr. Ratliff’s favorite “official” title is that of dad. As luck would have it, a business trip to Nashville was scheduled for Father’s Day – a situation that would have resulted in missing his Father’s Day dinner tradition if he flew into another airport and had to drive the long commute back home. Instead, Dr. Ratliff flew with SHD and was home in time for his special dinner with the family! A happy business traveler and a happy dad – it doesn’t get better than that! 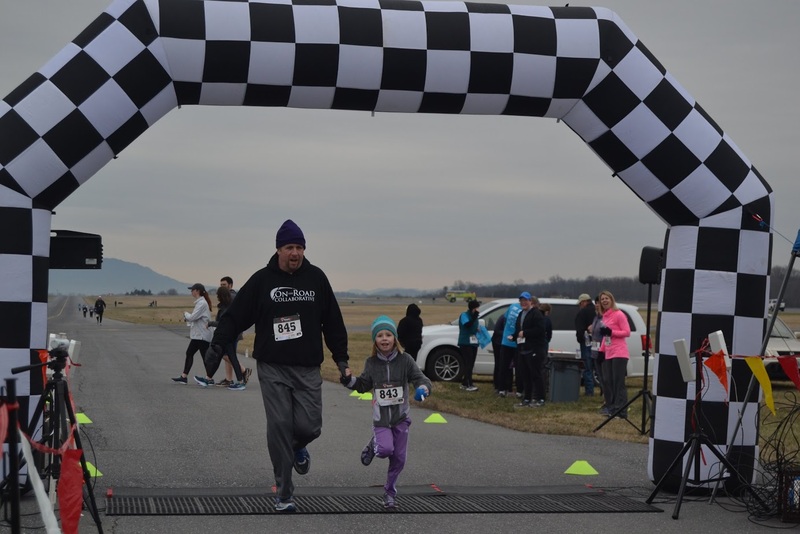 https://flyshd.com/wp-content/uploads/2019/01/Kevin-Ratliff-Family.jpg 900 1080 Shenandoah Valley Regional Airport /wp-content/themes/shd-enfold-child/images/logo.png Shenandoah Valley Regional Airport2019-01-30 18:19:042019-03-05 18:41:09SHD to the Rescue for Father's Day! When you think of snow, a day off from work or a cozy day inside might come to mind. At SHD, we think of snow a little differently. Our #1 concern is always safety and decreasing the impact of winter weather on operations. It’s a big job! Can you imagine if your driveway was 6,002 feet long – the length of our runway?! Here’s a behind-the-scenes look at some interesting facts and figures when it comes to managing snow at SHD! This area of Virginia averages 23 inches of snowfall a year. 1” of snow equals on average 1 lb. of snow per square foot. SHD’s runway is 6002’ long and 150’ wide. The adjacent taxiway is 6002’ long and 50’ wide. That is the equivalent to a 20-lane highway that stretches over 1 mile long! The total square footage of the runway and taxiway is over 1.2 million square feet. 23” inches on average of snowfall a year with 1.2 million square feet of pavement equals OVER 27.6 MILLION POUNDS of snow moved each year to keep YOU on schedule and getting wherever it is that you need to go! 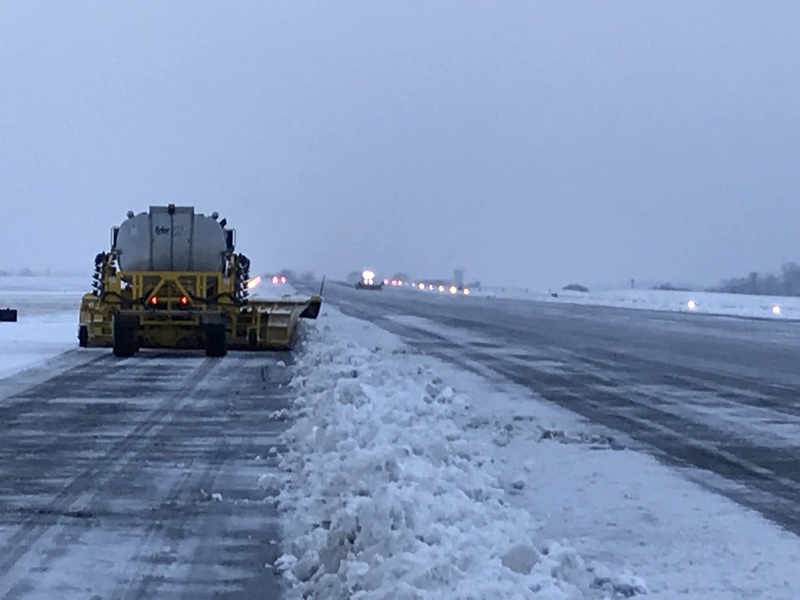 During snow and other winter weather, our team is responsible for maintaining a safe operating area for aircraft by clearing runways, taxiways, and other surfaces. The airport has snow removal operations “airside” (runways, taxiways, and ramp areas) and “landside” (parking lots, and additional roads). SHD has approximately 20 trained snow removal personnel. Personnel experience is key to the success of each winter weather event. Majority of our personnel has over 10+ years of experience – several have over 20 years of experience! SHD has approximately 15 pieces of equipment to handle both “airside” and “landside” operations. The equipment includes blowers, brooms, blades, plows, and spreaders. In 2017, SHD acquired two multi-task machines that can plow, sweep, and blow snow at the same time. Each of these machines has a 20 ft. snow plow, an 18 ft. high-speed tow behind broom that spins upwards of 500 RPMs, and air blowers that blows air at speeds over 300 MPH! Below is a list of some other equipment that SHD uses to keep the airport going during winter weather. 2 Volvo L60E Front End Loaders. Each of these includes a snow blower, ramp plow, and broom attachments. Various other vehicles with snow plows for both landside and airside operations. Click here to see a piece of our newest equipment in action last weekend! As you can see, a lot goes into snow removal efforts at an airport! We are proud to say Team SHD is the best of the best at keeping your local airport open and operational. Next time the snow starts to fall, rest assured that we’re doing everything possible to keep your travel plans safe and seamless! Happy New Year Valley Travelers! I hope you had a wonderful time ringing in 2019! Resolutions go hand-in-hand with the start of a new year, so we thought we would help you to make some great travel-related resolutions with the four suggestions below. Make lasting memories, streamline your business travel, travel like a pro, and reward yourself with a springtime getaway – read on to see how! 1. Visit at least one bucket list destination this year! Are you dreaming of a tropical getaway, an epic adventure, or a visit with a faraway loved one? Don’t put off the dream any longer! SHD can help get you to your dream destination through two major hubs – Chicago O’Hare and Washington Dulles. In fact, Chicago O’Hare is ranked #1 in the U.S. for flight connectivity with 81,913 one-stop domestic flights and over 128 daily direct flights to 50 international destinations! Plus, United offers 30 daily nonstop flights from Dulles to 30 international destinations as well as 195 daily domestic flights to 74 airports across the United States. Our in-house fare specialists even provide free booking assistance to help you plan your trip. Simply call 540-234-8304 x2. We’re not just in the travel business; we’re in the making lifelong memories business. Let’s get you where you want to go in 2019! 2. Start enjoying your business travel. Get back the minutes that tick away while you sit traffic, stand in long security lines, and fight crowds to get to your gate. Choosing SHD saves you valuable time, makes travel less stressful and gets you back to your family sooner! Want to know what your out-of-town airport is costing you in terms of time? Check out our True Cost Calculator! 3. Travel like a pro with United MileagePlus and TSA Precheck. Put the power of a personal travel assistant in your pocket with the United Airlines app! Give yourself the (free) gift of real-time flight status alerts, mobile check-in, baggage tracking, and more through one convenient app. Earn miles while you fly and for everyday purchases from participating stores and keep track of them all in the United Airlines app! Use your miles for flights, rental cars, hotels, and exclusive experiences. Already a member of another frequent flyer program? No problem! Check out United’s MileagePlus Premier Status Match Program to see how you can instantly get comparable perks from United. 4. Take a long weekend to relax and recharge! Give yourself a boost after a long winter with a spring trip to one of the most famous cities in the world – Chicago! Epic architecture, arts & culture, cuisine, and more await you in Chi-town. Our non-stop, roundtrip flights to Chicago start at just $210. Click here to book your flight today! Whatever your travel goals for 2019, we’re here to help! We appreciate all of you that made SHD your airport of choice in 2018, helping to make it a record-breaking year for passenger traffic! If you haven’t tried SHD yet, we invite you to experience all that we have to offer this year. https://flyshd.com/wp-content/uploads/2019/01/happy-new-year-2019-design-with-white-background_1142-5655.jpg 626 626 Shenandoah Valley Regional Airport /wp-content/themes/shd-enfold-child/images/logo.png Shenandoah Valley Regional Airport2019-01-02 21:57:142019-01-22 21:57:58Make 2019 Your Best Year of Travel! The hustle and bustle of the holidays is at its peak! What makes the holidays memorable though are the special people we spend it with and the traditions we create over the years. From the SHD family to yours, we’d like to share some of our favorite holiday traditions with you. 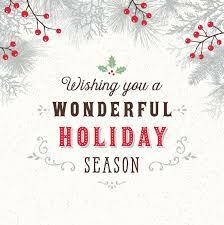 We wish you a safe and joyful holiday season filled with special memories! Every Christmas Eve as a child I always looked forward to getting to open one special present early – new Christmas pajamas to wear that night. It always seemed to make the wait for Santa Clause even more exciting. Now that I have two daughters of my own, we carry on that tradition gifting them matching pajamas on Christmas Eve. At 5 and 7 years old they still think it’s pretty cool to look like twins! For 30 years now, I have hosted brunch at our house on Christmas morning. 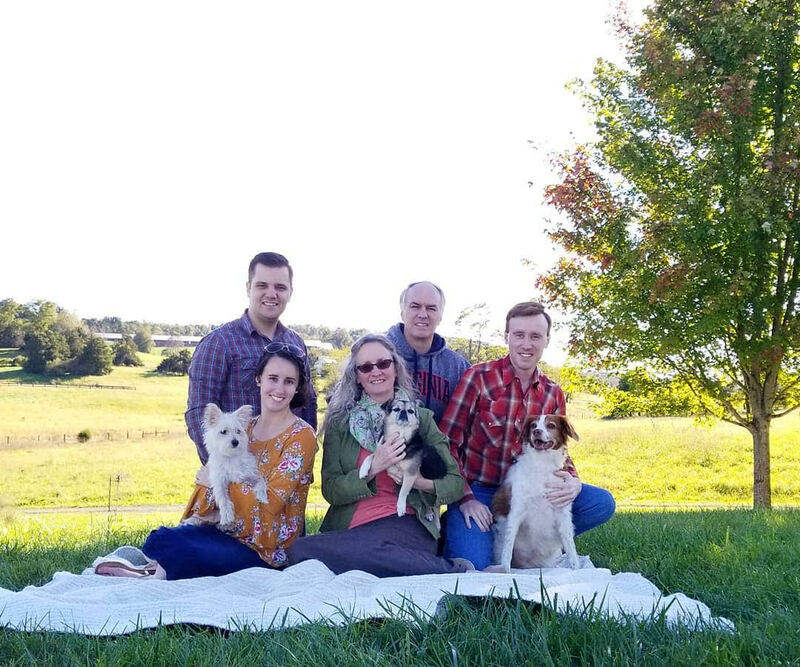 We used to have about 25 family members joining us but as children have grown up and moved away to start families of their own, we are down to about 10 of us. Even with brunch being a little bit quieter now, we still really enjoy this special time together. When our kids were younger, we would rush home from wherever we were to put out milk and cookies for Santa, and sometimes sprinkle reindeer food on the sidewalk. Then we would all sit together on the floor, and I would read ‘Twas the Night Before Christmas’ before the kids went off to bed so the magical night could begin. My children are now 14 and 17 so those times have passed, but I still have the same copy of this book that I read to them for many, many years. One of my favorite memories growing up was when we would go as a family to look at Christmas lights around where we lived in Parkersburg, WV. Every year, we go to Tastee Freez and get a Christmas cone, which is soft serve ice cream with red and green sugar sprinkles, and ride around for hours looking at Christmas light displays all around Staunton, Waynesboro, and Augusta County. We always listen to Christmas music and share stories of years past while driving around. It never really feels like Christmas until we have done this tradition. And even though I have the DVD and Blu-Ray, I still watch “24 hours of A Christmas Story on TNT” at least once through. My parents were divorced and each December my three sisters and I would watch the mail for a big package to arrive from my dad. If we were lucky, it would show up while my mom was still at work and we could carefully open each one with a butter knife to see what was inside. Then we would wrap it back up like nothing ever happened. I’m pretty sure my mom still has no idea we did this! If you’re like us, your holiday shopping is in full swing! For the travelers on your list, we’re making your gift giving a breeze with the best travel gifts, gadgets, and gizmos. From commemorating world travels to making travel more comfortable, there’s something for everyone in this gift giving guide. Travel like a pro with this 3-in-1 travel bag. Attach it to your suitcase, transform it into a backpack, or use it as a shoulder bag. Multifunctional pockets, straps, and compartments are perfect for organization that can adapt to your needs. 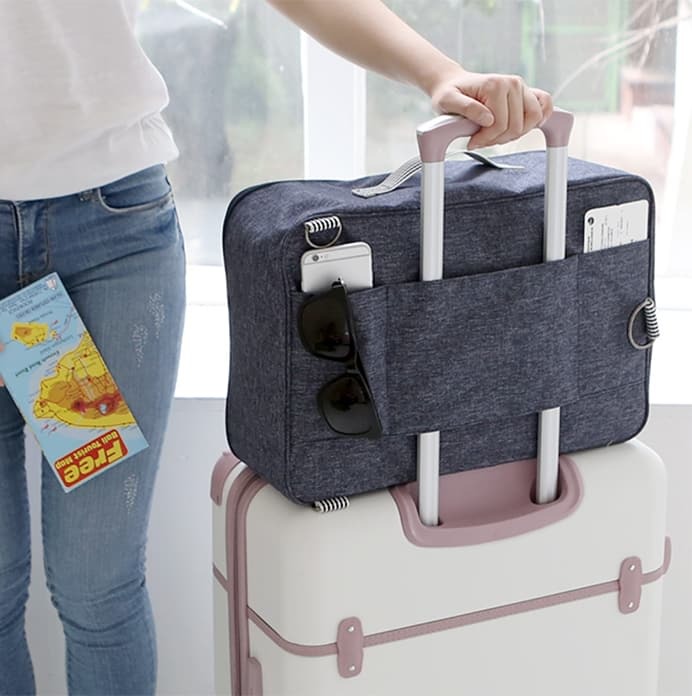 Take a look at why the Multiway Travel Bag by Mochimakes our top 5 list! Stocking Stuffer Bonus: Add a bag luggage straps make navigating the airport with multiple suitcases a breeze. Every traveler will appreciate the convenience and practicality of this gift! Every savvy traveler will appreciate a compact portable power bank to keep their gadgets charged on the go. Take into consideration the type of device being charged when choosing the milliamp hours (mAh). Higher milliamp hours mean more charges. Stocking Stuffer Bonus: Never dig through a bag, pocket, or suitcase for device cords and accessories! Keep them organized in one place with a travel cable organizer. It will soon be a must-pack item for your busy traveler. 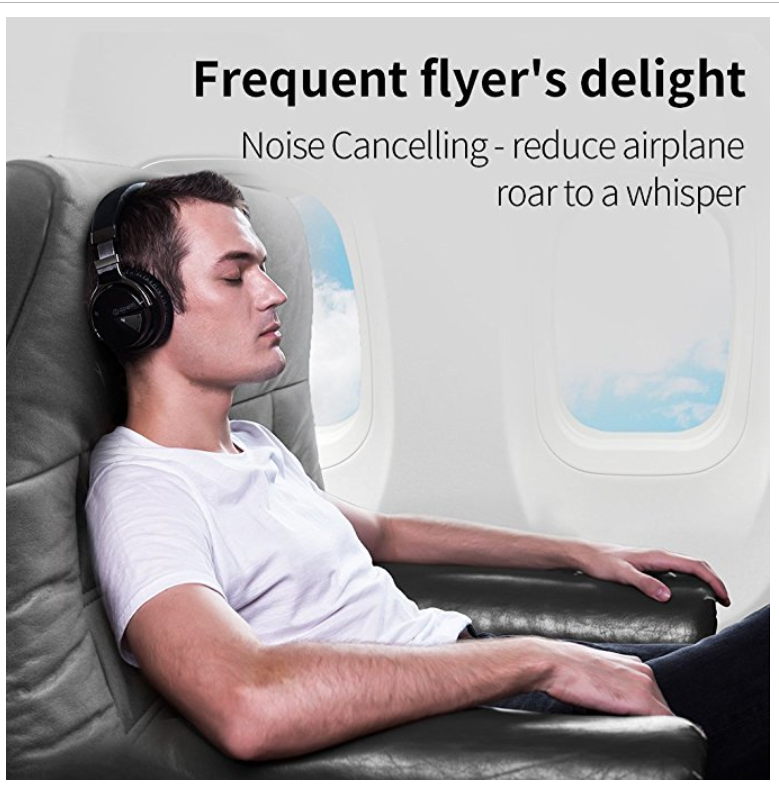 If you’re a frequent business trip flyer or flying internationally, noise cancelling headphonescould be your saving grace for working without distraction or getting a good night’s sleep. Unlike passive headphones, noise cancelling headphones reduce unwanted ambient sounds and allow you to listen without having to increase the volume. While noise cancelling headphones are typically more expensive, you can find quality options starting at around $40.00 per set. Stocking Stuffer Bonus: To compliment the noise cancelling headphones, add an inexpensive 3D sleep mask for blocking light. Your favorite traveler will love the gift of good sleep! Stocking Stuffer Bonus: Keep the good rest coming with an inflatable ergonomic travel pillow that provides maximum comfort. The best part? When it’s not in use, it’s easy to deflate and pack away. Flights can be a challenge for good circulation in your legs and feet. Give the gift of fashion and good health with stylish compression socks that anyone will be proud to wear! 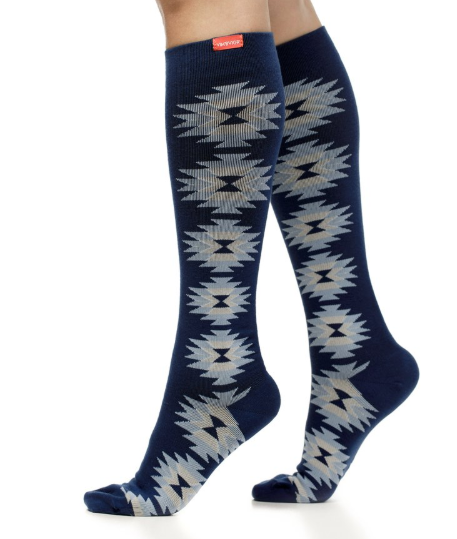 Fun designs and patterns make them indistinguishable from regular socks. 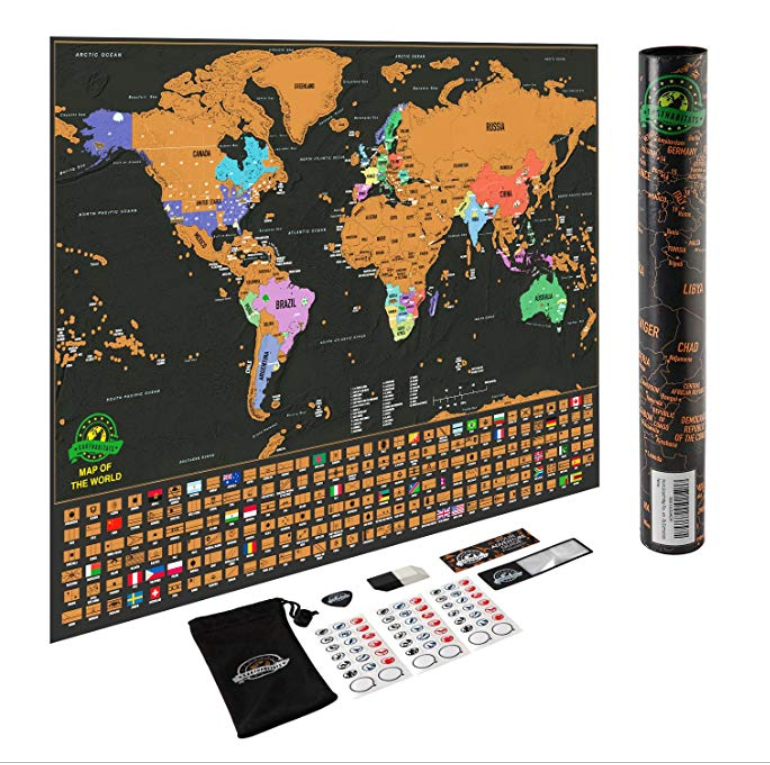 A scratch-off world travel map is a unique way for travelers to remember their adventures and track their adventures. Avid travelers will love commemorating their globe-trotting with this map that doubles as a work of art! https://flyshd.com/wp-content/uploads/2018/12/Gift-Giving.jpg 417 626 Shenandoah Valley Regional Airport /wp-content/themes/shd-enfold-child/images/logo.png Shenandoah Valley Regional Airport2018-12-12 10:35:412018-12-26 10:36:46Travel Gifts Everyone Will Love! ‘Tis the season to be jolly, and if you read this email to the end, it can also be the season of enjoyable holiday travel! We’ve compiled our top travel hacks for staying sane during the hustle and bustle of the holidays. With tips for pre-planning, packing, and making your flight, we’re making sure this really is the most wonderful time of year for travel! Before you even pack your bag, make sure to download the United Airlines app! Give yourself the (free) gift of real time flight status alerts, mobile check-in, baggage tracking, boarding notifications, and more through one convenient app. 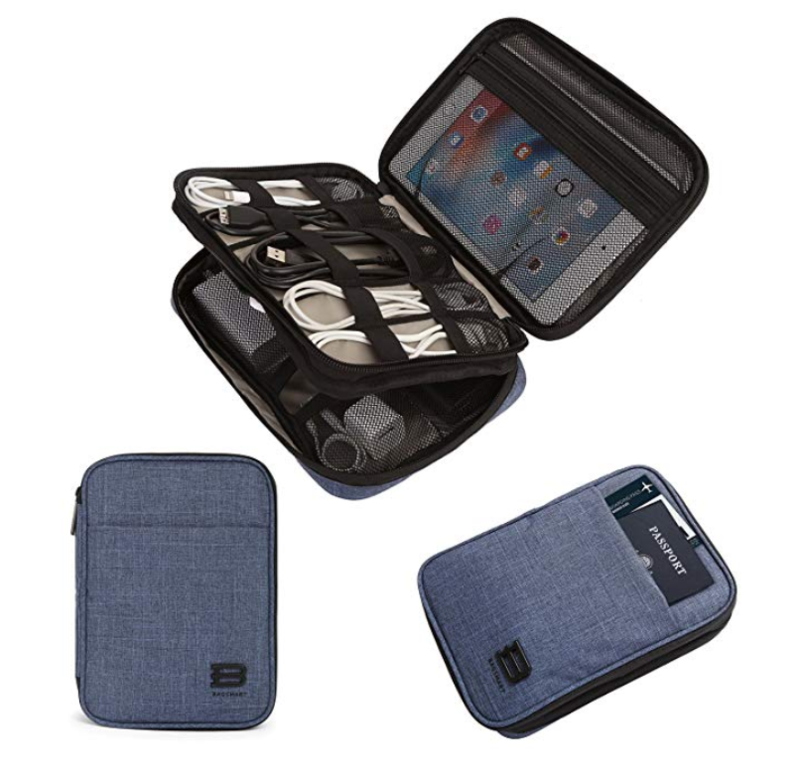 It’s your personal assistant on the go for holiday travel and beyond! Take photos of all your travel documents (your passport & itineraries for example) and email them to yourself in case these items are lost or stolen. Invest in a power bank or two and make sure they are fully charged so you can quickly charge your devices. Remember to turn your phone to airplane mode prior to takeoff so your battery doesn’t drain during flight. Packing during the winter season comes with its own set of challenges. Here are some of our best seasonal travel hacks, along with tips you can use any time of year! 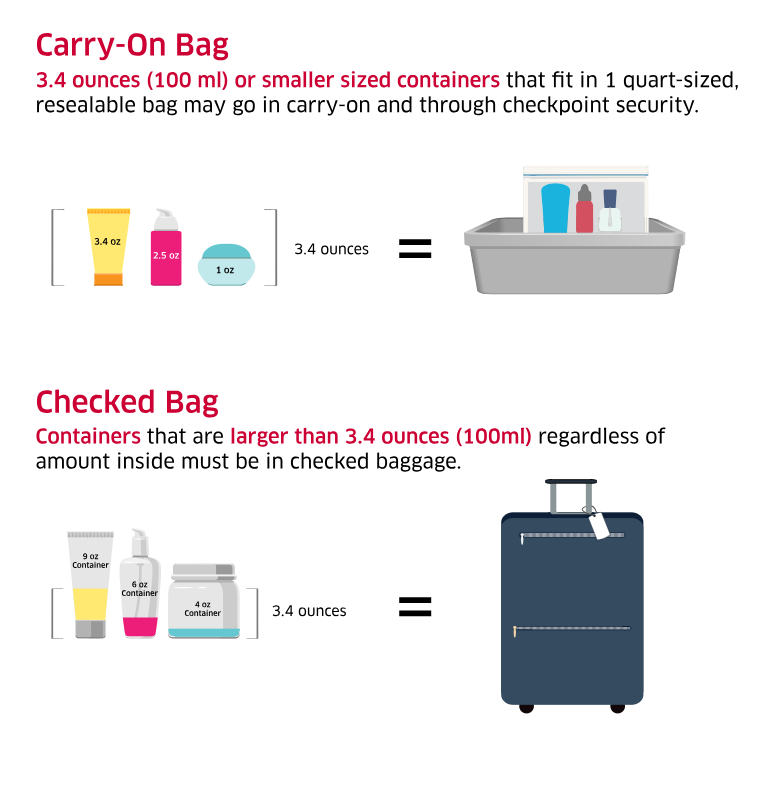 Don’t forget to check TSA.gov in advance for guidelines and resources about what you can pack. If you’re traveling to a place with winter weather or rain, use a hard-sided suitcase that can repel outside moisture more effectively than soft-sided suitcases. Plan to wear your heaviest clothing items like your winter coat and boots on the plane to make your checked bags lighter. If you’re packing gifts, plan on wrapping them when you arrive at your destination. Wrapped presents could cause delays when you’re going through security. Better yet, give experiences instead and save yourself the hassle of pack bulky gifts! Keep your clothes smelling fresh longer, by packing a dryer sheet in your bag. Try rolling your clothes instead of folding them to create more space. Pack your shoes in shower caps to keep them from touching your clothing. Put plastic wrap over the opening of bottles and screw the lid over top of the plastic wrap to prevent liquids from leaking. String necklaces through straws to keep them untangled. One of the biggest travel mistakes people make is not allowing themselves enough time catch their flight. Arrive at least one hour prior to your departure at SHD.This ensures that you have plenty of time to deal with any unexpected issues and still board your flight on time. Many airlines, including United at SHD, will not allow you to check-in for a flight inside a 30-minute window. With these tips in mind, we hope you’ll have your best holiday travel experience yet! And remember, SHD is always here to answer any travel questions you may have. https://flyshd.com/wp-content/uploads/2018/12/side-view-woman-on-the-festive-christmas-market-at-night-happy-woman-looking-up-with-christmas-light-at-night_1391-894.jpg 417 624 Shenandoah Valley Regional Airport /wp-content/themes/shd-enfold-child/images/logo.png Shenandoah Valley Regional Airport2018-12-05 11:45:262018-12-09 12:01:30Holiday Travel Problems Solved!